The Telecom Regulatory Authority of India (Trai) in its Telecom Subscription Data Report for the month of March 2018 has revealed that Wired Broadband subscriber base in India declined from 22.97 million at the end of February 2018 to 22.81 at the end of March 2018. The net decline in the wireline subscriber base was 0.15 million with a monthly decline rate of 0.67%. Furthermore, the report said the share of urban and rural subscribers in the total wireline subscribers were 85.19% and 14.81% respectively as of March 31, 2018. Speaking about the operators, the two public sector units, Bharat Sanchar Nigam Limited (BSNL) and Mahanagar Telephone Nigam Limited (MTNL) held 68.45% of the wireline market share. The overall wireline teledensity declined from 1.77% at the end of February 2018 to 1.76% at the end of March 2018. Urban and Rural wireline teledensities were 4.73% and 0.38% respectively during the same period. The two PSUs are currently holding 68.45% of share, while the private firms are currently holding 31.55%. 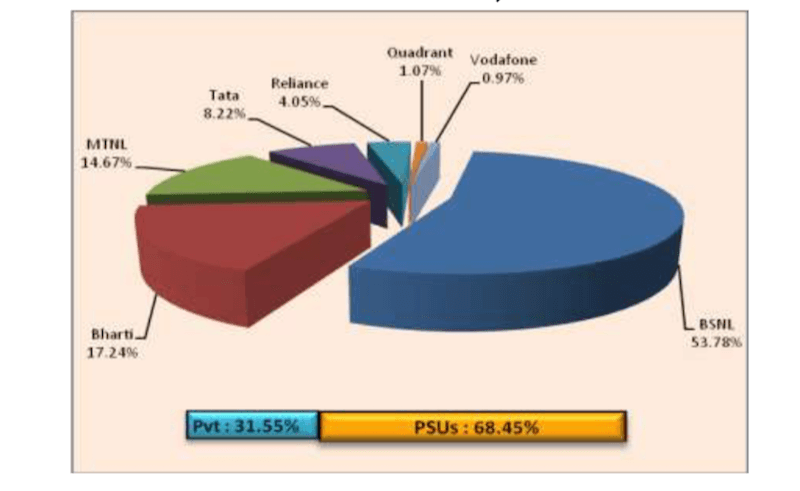 Bharti Airtel has the second highest market share with 17.24%, while Vodafone has 0.97% share. During the month of March 2018, Vodafone’s YOU Broadband added 13,000 subscribers, whereas Airtel managed to grab 8437 subscribers. BSNL might still be the leader, but the state-run telco is losing customers on a regular basis. 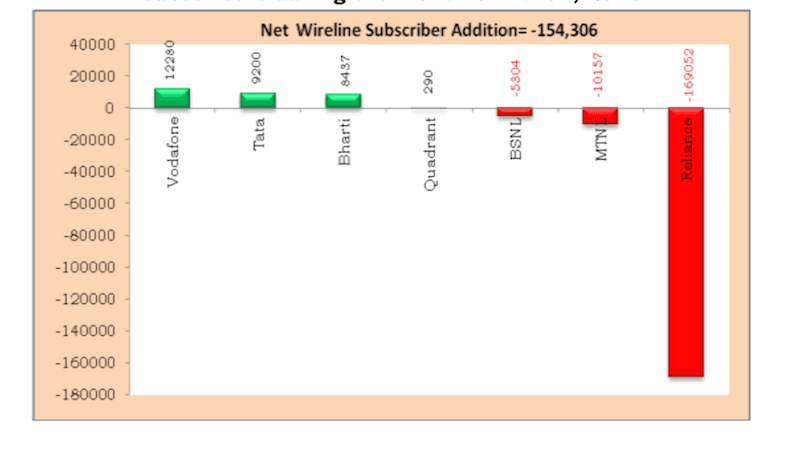 During March 2018, BSNL lost 5304 subscribers, and MTNL lost 10,157 subscribers. As on March 31, 2018, the top five Wired Broadband Service providers were BSNL with 9.30 million users, Bharti Airtel had 2.18 million subscribers, Atria Convergence Technologies (1.31 million), MTNL (0.87 million) and Hathway Cable & Datacom (0.78 million). In the wireless broadband segment, the number of broadband subscribers increased from 392.06 million to 412.60 million during March 2018 with a monthly growth rate of 5.24%. The top five service providers constituted 95.23% market share of the total broadband subscribers, and the service providers are Reliance Jio (186.56 million), Bharti Airtel (85.67 million), Vodafone (59.77 million), Idea Cellular (39.84 million) and BSNL (21.08 million). There’s no doubt that BSNL is facing the heat in the Indian broadband market with players such as ACT Fibernet, Airtel and others are upping the ante by offering more FUP and high-speed internet at affordable rates.